On Tuesday 10th July, CAT’s Paul Allen was in Ireland giving evidence to the Irish Assembly Dáil Éireann on ways of reaching net zero greenhouse gas emissions. Drawing on CAT’s Zero Carbon Britain (ZCB) work, Paul was invited by Brid Smith TD to offer evidence on the ‘Petroleum and Other Minerals Development (Amendment) (Climate Emergency Measures) Bill 2018’. The bill proposes a ban on the future granting of licences for fossil fuel exploration and extraction in Ireland. 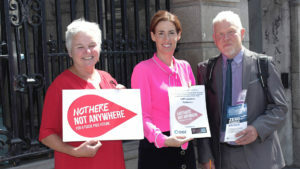 Introduced by People Before Profit TD Bríd Smith, it passed its first stage in spite of Government opposition – it is expected to clear its next stage as Fianna Fáil have indicated continuing support for the Bill. Alongside the ZCB presentation, Oil Change International’s research director, Greg Muttitt made it clear that Ireland’s Paris Agreement targets could not be achieved without a major reduction in fossil fuel consumption, arguing that further exploration is the wrong direction. Paul Allen, who coordinates CAT’s Zero Carbon Britain research, made a clear case that physical problems have physical solutions, and no amount of talking will make them go away. Watch the opening statements from TD Bird Smith.